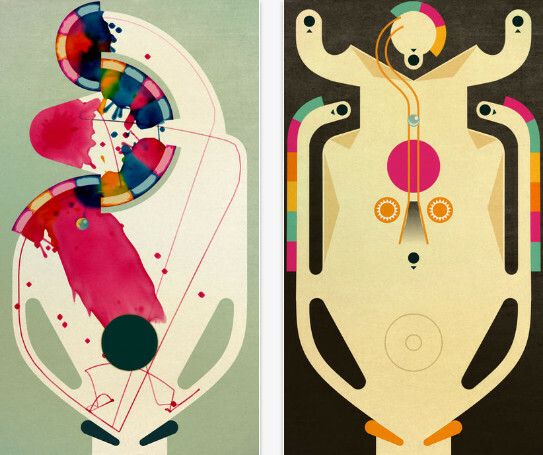 INKS updates pinball for iPhone and iPad, a new generation. It combines the joy of pinball with skilful tactical challenges. And allows you to create wondrous works of art as the ball smashes around the canvas. Blocks of color burst like beautiful fireworks across the surface, building up in vivid layers and recording a visual history of your game as you perfect your score. If you’re enjoying INKS and want to extend. The experience further you can also buy Powerups slow mo ‘Precision’ aim and the ‘Stopper’ to prevent. You from losing the first precious Gold Ball. “Amazing looking… vibrant, full of life. Are we excited about this.” Pocket Gamer. Inspired by artists like Miro, Matisse, Jackson Pollock and Bridget Riley, each table becomes a unique work of art, sculpted by the player as they fire an ink-covered ball around the canvas. With State of Play’s creative flair and skill at crafting beautifully elegant gameplay, INKS offers something new: art and gameplay as one, for everyone.